*The Results of the matches are applicable for the female Bharani/Mesha Rasi; and the boys should look for their matches under their prospective female counterparts. Nakshatra Porutham: The Couples having Nakshatra Porutham would be blessed with all the goodness of their earthly life like Good mental & physical health, life longevity, wealth, childbirth, career, finance and happiness during their lifetime @ they would enjoy more auspicious events during their lifetime. 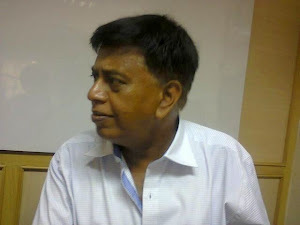 Worst Matchings: Kiruthigai, Ayilyam, Magham, Chittirai, Visakam, Jyestha, Moola, Dhanistha and Sathabisham. Mahendra Porutham: This matching would indicate the feasibility of possessing good mannered children @ the children born to the Couples having “Mahendra Porutham” would bring joy, happiness and fame to their Parents. Stree Dhreergha Porutham: This Porutham would indicate the probabilities of the Girl’s health and wealth after getting married to the Boy. Yoni Porutham: This Porutham indicate the sexual compatibility between the Couples. 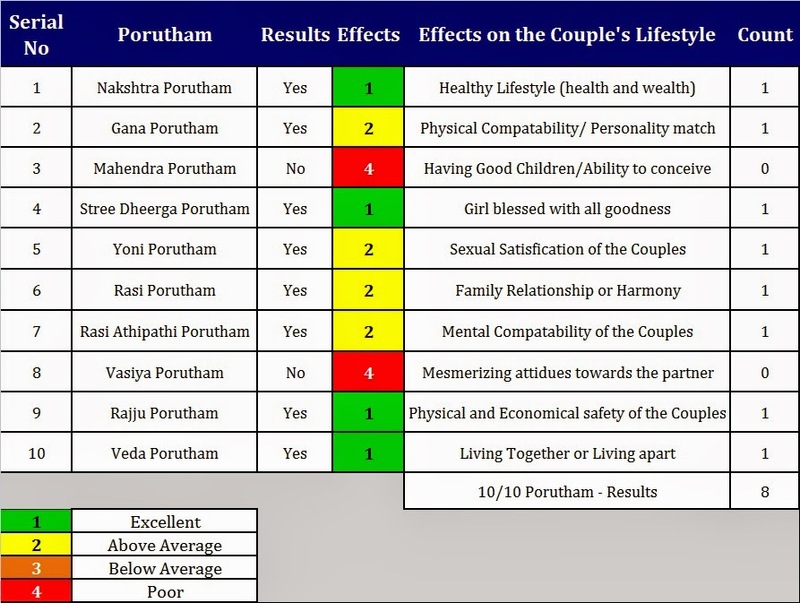 Rasi Porutham: This Porutham indicate the mental compatibility between the Couples @ if there are no Rasi Porutham between the Couples, then the Couples often quarrel and fight among them on daily basis on all issues. They would develop diametrically opposite views. Rasi Athipathi Porutham: This Porutham indicate the mental compatibility between the Couples @ if there are no Rasi Porutham between the Couples, then the Couples would take opposite views on important issues in their life; and remain rigid on their respective views. Vasiya Porutham: The Couples who enjoy this Porutham would admire their Partners despite their shortcomings and get addicted to them; and sub serve their interests. Vedhai Porutham: The Couples who has “Vedhai Porutham” are likely to live separately despite remaining technically as Couples. The Results for Marriage (Kalyana) Porutham between Bharani Girl and Anusham (Viruchika Rasi) Boy: 5 out of 10. (Results: 6 out of 10 is enough for a Marriage). The Results for Marriage (Kalyana) Porutham between Bharani Girl and Visakam (Viruchika Rasi) Boy: 5 out of 10. (Results: 6 out of 10 is enough for a Marriage). The Results for Marriage (Kalyana) Porutham between Bharani Girl and Visakam (Thula Rasi) Boy: 6 out of 10. (Results: 6 out of 10 is enough for a Marriage). 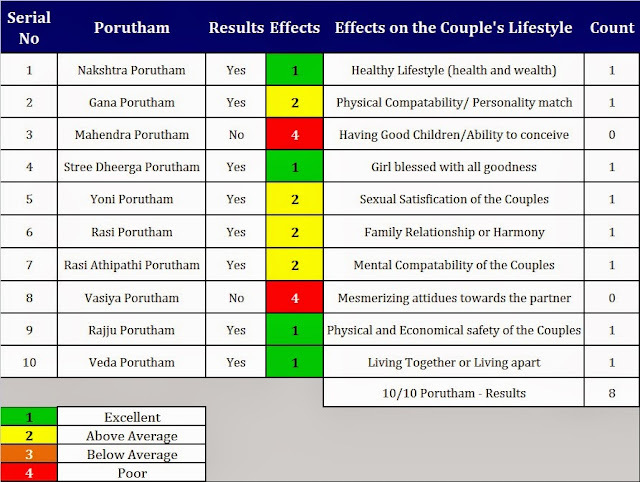 The Results for Marriage (Kalyana) Porutham between Bharani Girl and Swathi (Thula Rasi) Boy: 7 out of 10. (Results: 6 out of 10 is enough for a Marriage). The Results for Marriage (Kalyana) Porutham between Bharani Girl and Chittirai (Thula Rasi) Boy: 8 out of 10. (Results: 6 out of 10 is enough for a Marriage). 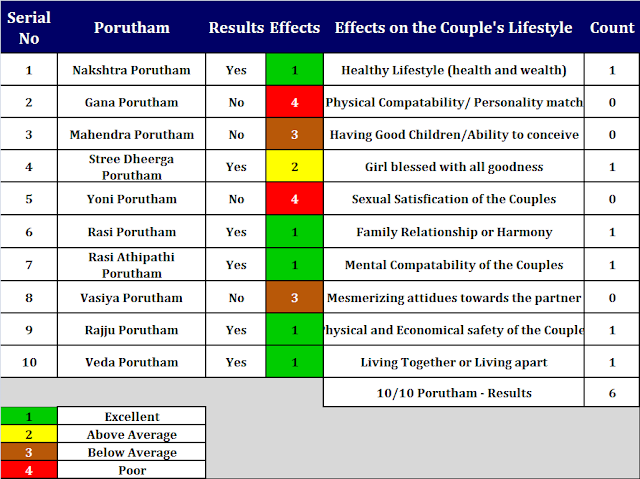 The Results for Marriage (Kalyana) Porutham between Bharani Girl and Uthiram (Simha Rasi) Boy: 8 out of 10. (Results: 6 out of 10 is enough for a Marriage). The Results for Marriage (Kalyana) Porutham between Bharani Girl and Pooram (Simha Rasi) Boy: 6 out of 10. (Results: 6 out of 10 is enough for a Marriage). The Results for Marriage (Kalyana) Porutham between Bharani Girl and Magham (Simha Rasi) Boy: 8 out of 10. (Results: 6 out of 10 is enough for a Marriage). The Results for Marriage (Kalyana) Porutham between Bharani Girl and Ayilyam (Kataka Rasi) Boy: 8 out of 10. 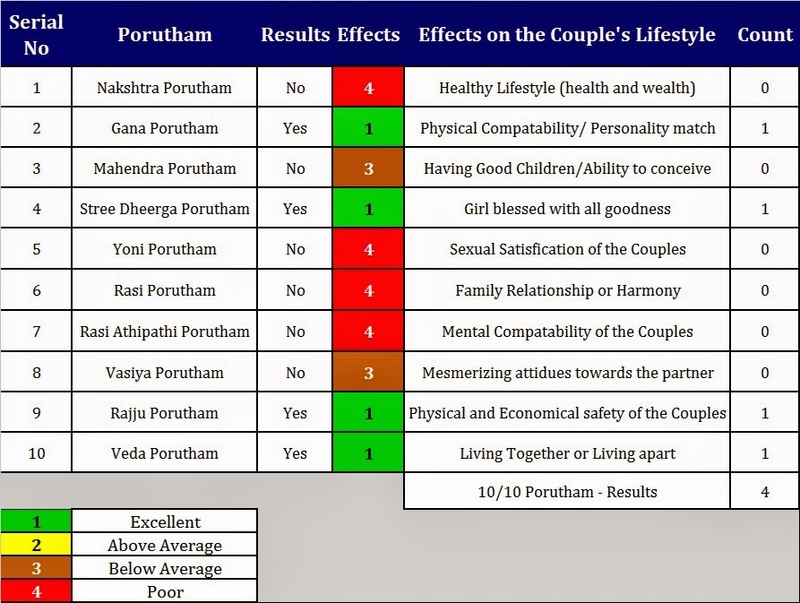 (Results: 6 out of 10 is enough for a Marriage). The Results for Marriage (Kalyana) Porutham between Bharani Girl and Pusam (Kataka Rasi) Boy: 6 out of 10. (Results: 6 out of 10 is enough for a Marriage). The Results for Marriage (Kalyana) Porutham between Bharani Girl and Punarpusam (Kataka Rasi) Boy: 6 out of 10. (Results: 6 out of 10 is enough for a Marriage). The Results for Marriage (Kalyana) Porutham between Bharani Girl and Punarpusam (Mithuna Rasi) Boy: 5 out of 10. (Results: 6 out of 10 is enough for a Marriage). The Results for Marriage (Kalyana) Porutham between Bharani Girl and Thiruvathira (Mithuna Rasi) Boy: 6 out of 10. (Results: 6 out of 10 is enough for a Marriage). The Results for Marriage (Kalyana) Porutham between Bharani Girl and Mirugasirisa (Mithuna Rasi) Boy: 5 out of 10. (Results: 6 out of 10 is enough for a Marriage). The Results for Marriage (Kalyana) Porutham between Bharani Girl and Mirugasirisa (Rishaba Rasi) Boy: 6 out of 10. (Results: 6 out of 10 is enough for a Marriage). The Results for Marriage (Kalyana) Porutham between Bharani Girl and Rohini (Rishaba Rasi) Boy: 5 out of 10. (Results: 6 out of 10 is enough for a Marriage).